Marks and scraped paint here and there along the edge of a drab-painted metal pit blind. They're left from a duck hunter's tapping a stubborn raw oyster in the afternoon cold, attempting to coax the thing open. A lasting reminder of the good times had. A compilation of ENC shenanigans. Ducks. Liquid Refreshments. Oysters. Toe Jam. Soft Crabs. Stogies. Steaks. Big White Birds. Biscuits. Tyrrell County. Wilson County. New Hanover County. I’m not asking ya’ll to fully understand what it was like growing up hunting and fishing in Eastern North Carolina. But it was great. It’s something I really am thankful for. It was cold and dark. There was that nip in the salty morning air that tells you its hunting season. The flame from the propane burner and the hot oil just starting to pop and bubble in the charred aluminum fish fryer would only momentarily warm my hands. My little brother and I stood around the burner. When the thermometer read 350, I dropped in two lightly breaded bluefish filets, trying not splash the oil. The cold filets sank in the hot oil. A few minutes later they floated to the surface, the breader crusted into that gold brown characteristic of most fried food. We ate them and they were darn good. If we had more time, I’d maybe’ve fried up an egg to go with it. Lot of people don’t like bluefish. Too oily. Too fishy. The simple trick of slicing off that oily layer of skin isn’t well known I guess. We always’ve loved catching them in the surf when they run down the coast later in the fall. And we always’ve loved cooking them up for breakfast during duck season. With our decoys and our guns in the truck we hauled through the salty dark away from the beach, across the intra-coastal, towards Castle Hayne and the Northeast Cape Fear. In our grogginess we didn’t really talk much. Past some trailers with a bunch of junk cars, a collapsing produce stand, and an out of business seafood market, we took our turn. It was a dirt and gravel trail. The trail though some pines turned into a causeway just wide enough for a truck, tidal salt marsh on our left, fresh water swamp and flooded timber on our right. Jay Jordan told us where we were going and we went . . . We got to the “woods pond” with about 45 minutes till shooting time. Any time of year besides cold duck season you wouldn’t want to be in there. Gators love it. It’s not really a pond, just a pretty open area in the flooded timber. Cold dark black water and cypress trees with Spanish moss and their damn cypress knees that I’ve tripped over too many times. We put our dad’s old decoys in the open area, about 25 yards out from where the wooded timber started to get thick. I waded carefully, hoping to avoid any holes left by old trees where the water would go over my head. The decoys didn’t look much like the ducks they were trying to imitate. Greenheads. Woodies. Teal. Most of the paint that was still there was faded and dull and chipped. I posted up against an old cypress, and my brother did the same some 10 yards to the left. At 6:38 we heard the wheeeeek, wheeeek of wood ducks flying through the trees in the swamp not too far off. 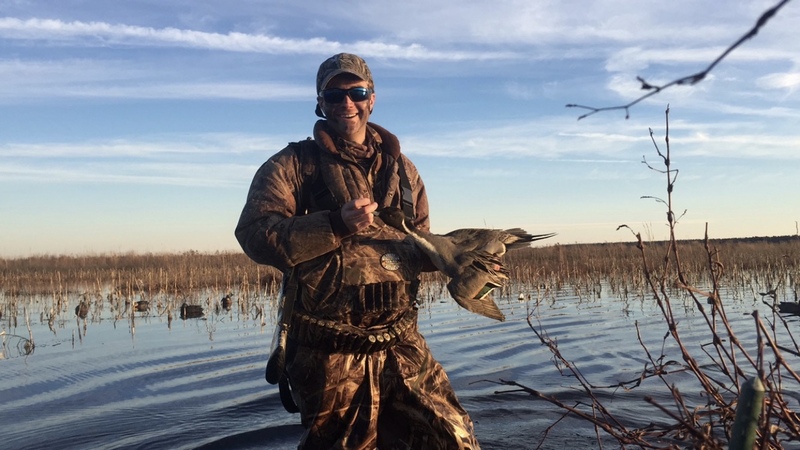 It’s the sort of sound that gets to most East Coast duck hunters, whose first duck hunt was probably in a flooded beaver pond, and the only ducks you’d see would be the wood ducks in that gray just about sunrise light. It’s the sound that makes you open and close your fist to keep blood flowing through your trigger finger so it isn’t too numb to painfully press down the safety then place it above the trigger guard. A minute till shooting time, a pair of woodies, silent except for that rush of fluttering wings that gets your adrenaline going, wove through the trees and flew right over us. They lit right in the decoys. As still as possible, I’d look at the two, a drake and a hen, swimming, bobbing their heads, dabbling at duckweed and diving for acorns. Then I’d look at the minute hand on my watch. 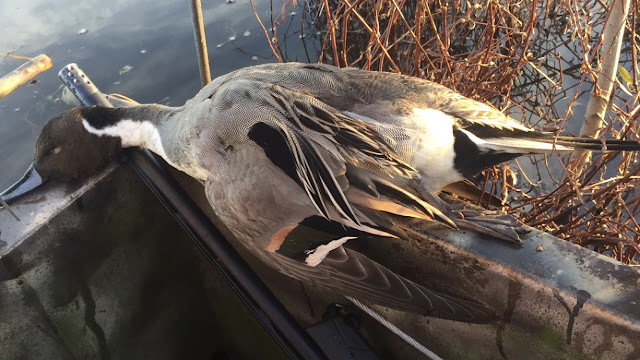 You never shoot ducks on the water unless they’ve been winged with a few pellets and are still swimming around. Then it was shooting time. We were legal. I heard more woodies through the trees and whispered to my brother. I saw them. Three woodies. Weaving through the trees damn fast. In a second they had their wings out, slowing them like flaps on a plane, and their webbed feet down, pointing towards the opening in our decoy spread. Your blood’s pumping and after you’ve pushed off the safety, you raise you gun to your shoulder and you lower your trigger finger into the trigger guard. You choose a bird, preferably the drake, put the bead on his head then move a bit ahead to lead him. You pull the trigger, the muzzle jumps a bit and a flash brightens the gray semi-darkness. You keep the gun moving, to follow through on the shot, almost like a golf swing. The size 3 steel shot rips through the air, the spread of pellets constricted by the choke at the muzzle end of the barrel. At 30 yards the spread’s about the size of a 30-inch circle. You see the bird crumple and fall and splash into the water. You check to make sure there aren’t any more birds coming in, and then you tell the dog to fetch. He soars through the air and splashes into the water. He uses his tail as a rudder as he swims towards the bird, and he grabs the bird in his mouth and swims back and drops it beside you. You give him a loving pat on the head and his tail’s up and wagging. He lives for this moment. It’s a drake. It’s got that distinctive green crested head with a hint of purple, and a brown burgundy chest with white specks. It’s got to be one of the prettiest ducks there is. It might not seem like that hunt should’ve stood out. I’ve had hunts where I’ve limited out, where there’s been so many birds trying to land on top of you that you don’t know which one to shoot at. But that hunt was special . . . It’s just stuck the way some things do and some things don’t. Life was simple and life was good. Something about frying up some bluefish for breakfast like we always did with Dad. Something about being out in the swamp on that cold morning. Something about the passed down decoys, passed down guns, passed down waders and passed down clothes. Something about those good family friends that aren’t technically family but really are family. Something about that place, the people, the guns, the dog, and that moment. That moment with the sunrise and the swamp and the wheeeeek wood ducks hurtling through the trees.